G&E is a UK based registered Charity No: 1122271 organisations which were established in 2007 with the aim of helping to eradicate poverty for orphaned children and poor people through Bangladesh. 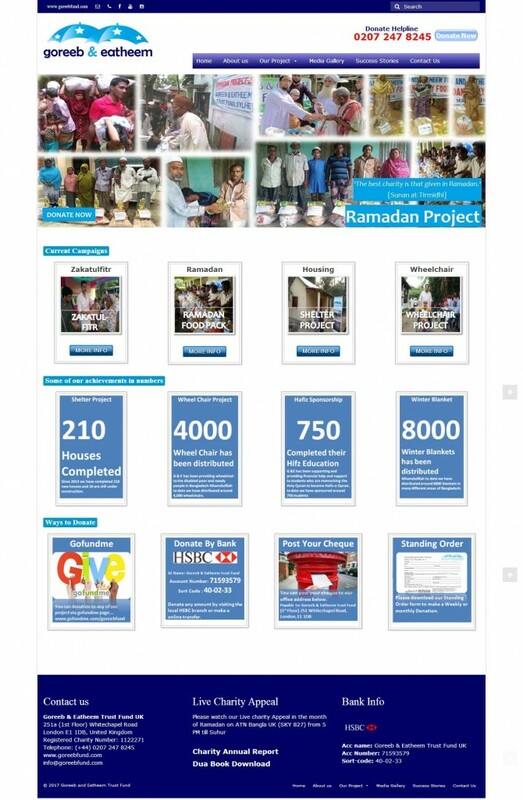 Our activities and objectives are to provide financial support towards the educational needs of children from poor families, help to deliver education by building Madrasa schools, to provide access to educational materials and development programmes for study, to build shelter for the homeless, distribute wheelchairs to disabled people. Other projects include Medical treatment, Rickshaws, Sewing Machine distribution among poor women, Orphan project, Qurbani project, Winter Blanket Project and financial help for widows. Between 2007 and 2015, Goreeb And Eatheem Fund Trust UK has donated over £800,000 to different projects all over Bangladesh. One of our main priorities is to provide financial support towards the education of poor children. We recognise the importance of education hence our commitment to provide it abundantly. We provide schools, study materials and study programmes to serve our commitment.